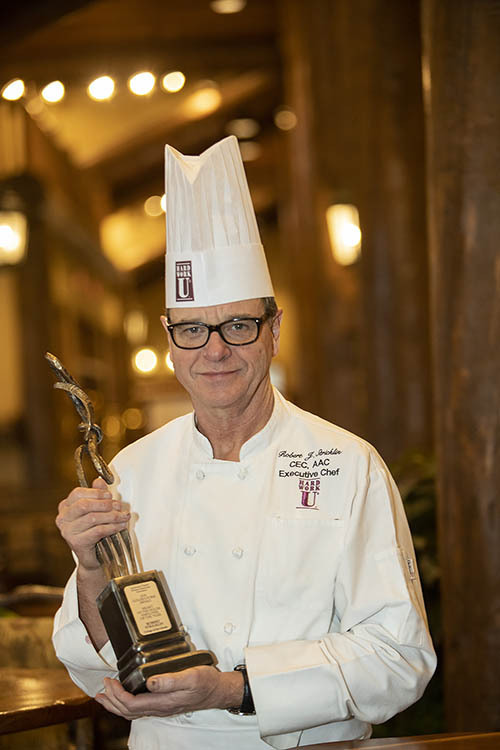 The Southwest Missouri Restaurant Association honored The Keeter Center Executive Chef Robert Stricklin with a Golden Fork Award at a ceremony on Sunday, January 20, 2019. Stricklin was named the Heart of the House during the annual awards gala. Two College of the Ozarks students were awarded scholarships at the Southwest Missouri Restaurant Association awards gala. 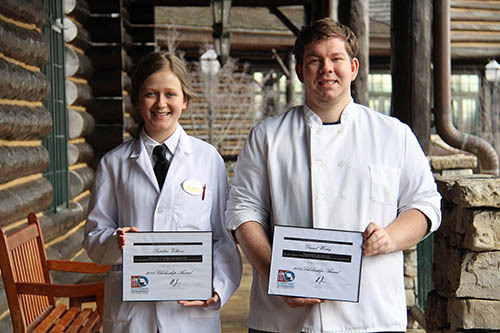 Seniors Svetlana Volkova (hotel and restaurant management major) and Daniel Worley (hotel and restaurant management and culinary arts double major) were each awarded $1,500 scholarships. They applied for and were chosen to receive the scholarships by a team of reviewers from the Southwest Missouri Restaurant Association Chapter. POINT LOOKOUT, MO. — The Southwest Missouri Restaurant Association honored The Keeter Center Executive Chef Robert Stricklin with a Golden Fork Award at a ceremony on Sunday, January 20, 2019. Stricklin was named the Heart of the House during the annual awards gala. The award honors a back-of-the-house employee who exemplifies exceptional service and execution in their position, profession, and industry and is seen as successful in the eyes of his fellow operators and employees. Fellow peers in the industry nominated Stricklin for this award. During his introduction, Brian Brown, vice president of local sales for US Foods, noted Stricklin’s stellar career and remarkable achievements as both executive chef of The Keeter Center and director of the culinary arts program at College of the Ozarks. “As head of the culinary arts department at College of the Ozarks and executive chef at the College’s renowned Keeter Center, he not only imparts his own culinary mastery to the menus he develops but he also fosters young aspiring chefs attending the College’s culinary arts degree program,” Brown said. Stricklin, a certified executive chef and member of the American Academy of Chefs, brings more than 40 years of culinary experience to his roles at the College and The Keeter Center. He has worked in Four and Five Star venues all over the world and has found his life’s passion teaching students and overseeing the culinary and dining operations, including the high volume banquet and catering services, at The Keeter Center. “Now what I consider success is not the awards that you receive but the information and the knowledge you pass on to the younger generation. Nothing pleases me more than teaching someone how to do something and then eventually seeing that person master it better than you,” Stricklin said. Students from The Keeter Center hosted a dessert reception after the award program, serving more than 200 people. Two College of the Ozarks students were awarded scholarships at the event. Seniors Svetlana Volkova (hotel and restaurant management major) and Daniel Worley (hotel and restaurant management and culinary arts double major) were each awarded $1,500 scholarships. They applied for and were chosen to receive the scholarships by a team of reviewers from the Southwest Missouri Restaurant Association Chapter.